Just 7 grams of net carbs in this dinner recipe! 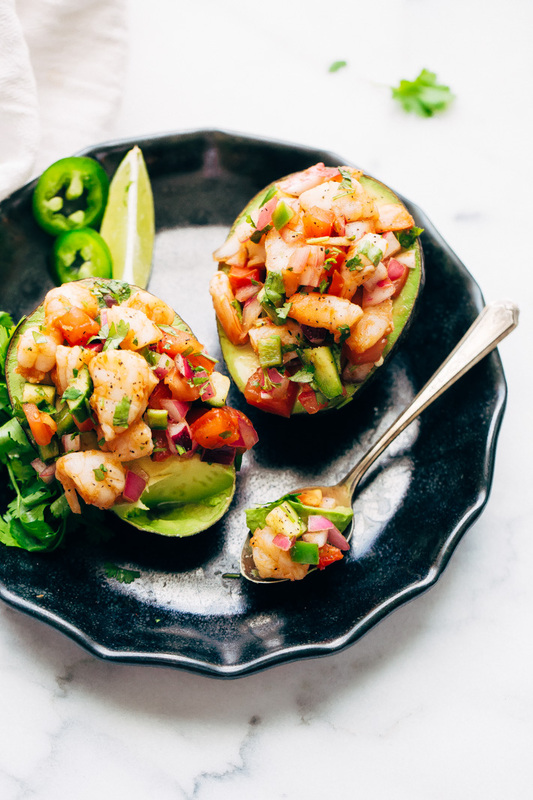 Shrimp ceviche or Mexican shrimp cocktail stuffed avocados with tons of veggies in a spicy sauce. These stuffed avocados are sure to become a summer dinner favorite! Say what?! 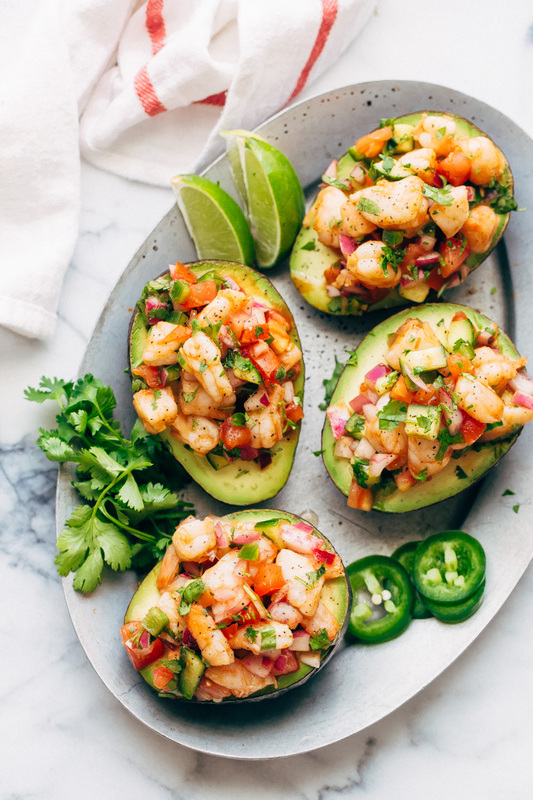 Shrimp cocktail stuffed avocados are everything. Hands-down the best low-carb dinner of the century. 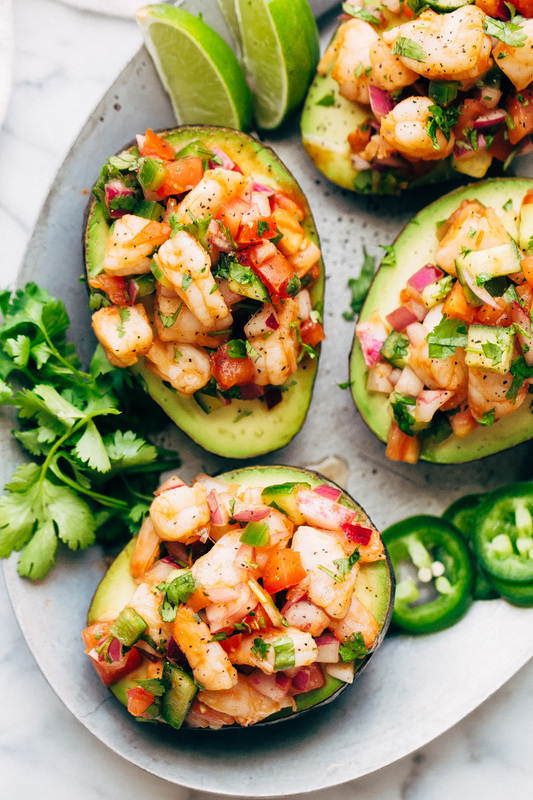 Those buttery, delicious avocados are cut in half and filled with a simple combination of shrimp, cucumbers, tomatoes, onions, jalapenos, and a tomato based spicy, tangy sauce. 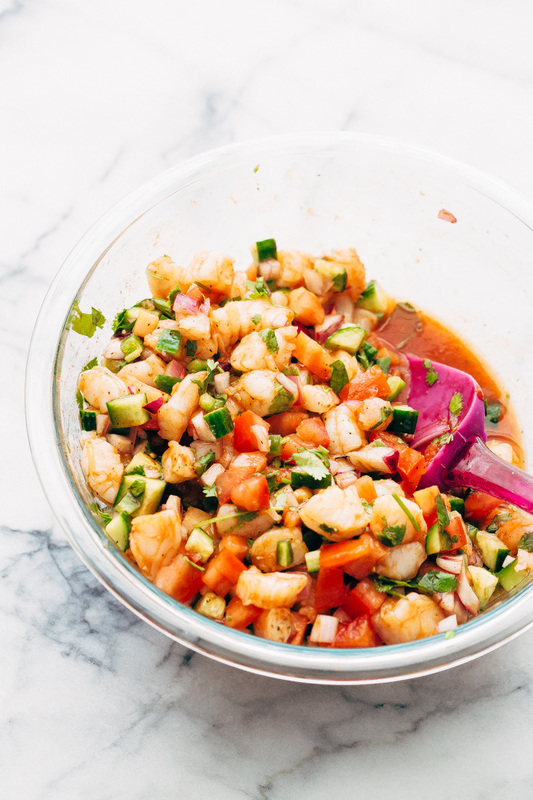 Okay, so you could call this Mexican-style shrimp ceviche, only I’m a horrible food blogger for telling you this, but we’re not actually ‘cooking’ the shrimp in lime juice as traditionally done in ceviche. I’m a total wimp and find the whole concept just a tad bit on the scary side. Okay, I downplayed that. The reality is I find it utterly TERRIFYING. Risk eating raw seafood? Thanks but no thanks. We don’t need this year to be marked by the Raw Shrimp Disaster of Twenty-Seventeen where little old me told you to cook your shrimp in lime juice, inadvertently giving your whole family food poisoning. So we’ll just take ourselves to the seafood counter and pick up a pound or so of those precooked shrimp that the fish monger is happy to bag up for us and save ourselves from a highly uncomfortable situation. 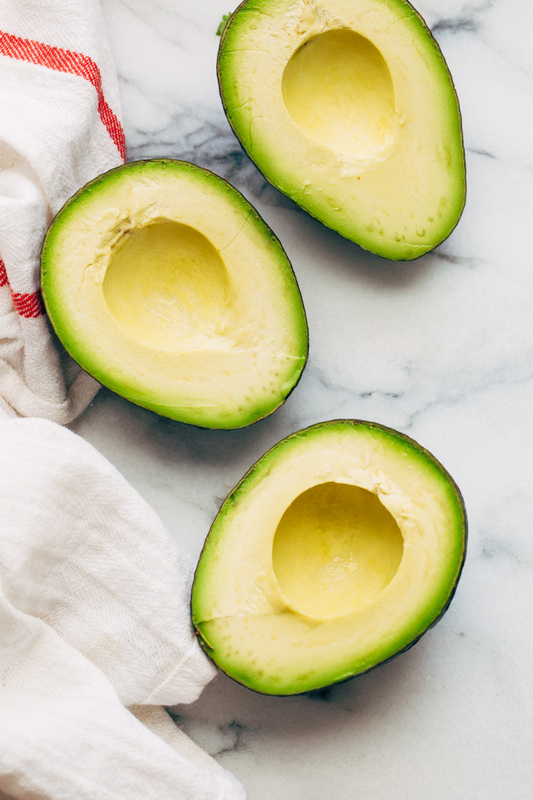 If you want to be extra fan-cy and show off in front of your dinner guests, you can brush the avocados with a little bit of olive oil, generously sprinkle with some salt, and throw them on the grill to give them some summer lovin’. Grill marks make everything taste that much better. We’re the type of people that have zero patience in firing up the grill when it’s 101ºF. 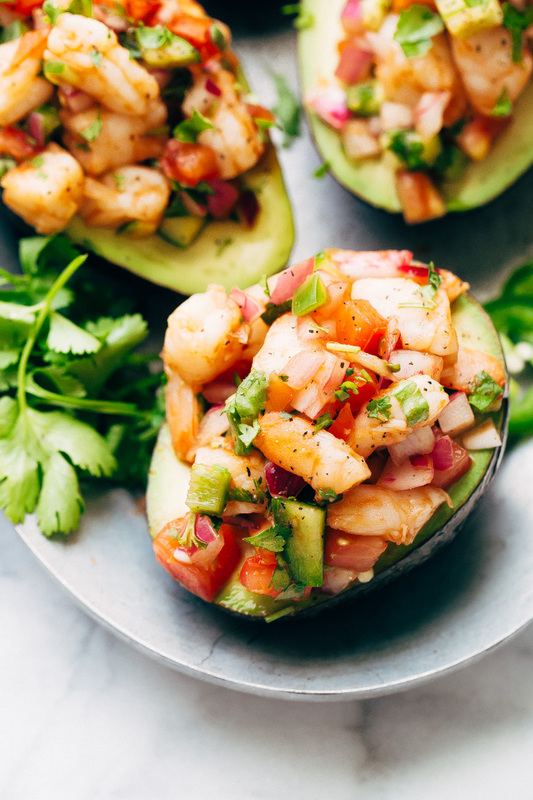 I’ll take my avocados cold straight from the fridge and with shrimp ceviche piled on high. It’s no coincidence that this stuffed avocado recipe requires NO cooking. Friends, the 4th of July brought with it just the tip of the inevitable summer heat. I’m certainly not stepping near a stove unless it’s necessary. Give me all the cold meals; I don’t want anything HOT! The idea quickly expanded into Mexican shrimp cocktail stuffed avocados where tomatoes, cucumbers, onions, cilantro, and jalapenos play a decent enough roll for me to rid myself of the guilt factor. Not only do these avocado boats look prettier with all that veggie color but this meal still contains just 7 grams of net carbs and a whopping 14 grams of fiber. Talk about nice and filling! Let’s breakdown that sauce. I’m using store-bought cocktail sauce from the condiment aisle and sprucing it up with some hot sauce and lime juice to give it that bright flavor. There is no shame in a little semi-homemade meal that’s light, healthy, and refreshing. Ketchup is okay to use if you want to make this meal in a hurry and have all the ingredients except the cocktail sauce and don’t want to make a special trip to the store. It works as a decent substitute, especially if you up the cayenne and the hot sauce by just a tad bit. I do find the horseradish from the cocktail sauce helps provide that flavor profile we all love about shrimp cocktail, so definitely try it that way too. What to expect? Creamy avocados piled high with homemade shrimp cocktail. That first bite has a little bit of everything. The heat from the ceviche mellows out nice and smooth on your tongue when paired with the avocado. And hey, I get if avocado boats aren’t your thing. You can easily dice up the avocados, combine them with the rest of the shrimp cocktail ingredients and serve it in a clear glass bowl. Optional but awesomely delicious: using a tortilla chip as a scooping vessel. I wouldn’t be doing my job if I didn’t tell you about that little trick. Wuv these kinds of low-carb meals! Add the shrimp, tomatoes, cucumbers, red onions, cilantro, and cocktail sauce to a large bowl. Use 1-2 jalapenos depending on your personal preference. For us, 1 jalapeno made this plenty spicy. Add the hot sauce along with 2 tablespoons of lime juice, cayenne, and a pinch of salt and pepper. Stir everything together, taste and adjust the lime juice, salt and pepper to preference. Cover and refrigerate the shrimp mixture for at least 30 minutes and up to 1 hour to allow the flavors to develop. Cut the avocados in half, remove the pit. If the avocado doesn’t have a large enough space to hold a significant amount of shrimp cocktail, scoop just a little bit of the avocado out to make space. We left them as is and just piled it on high. I like to serve these with tortilla chips on the side! To make this spicier you can up the number of jalapenos to two or three. We found that one jalapeno along with the cayenne and the hot sauce was spicy enough for us! 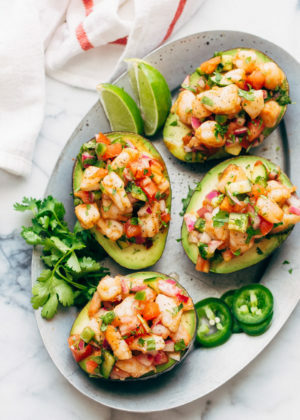 You can also dice up the avocados and add them to the shrimp cocktail if you don’t care for the avocado boat idea – these are delicious no matter how you eat them! 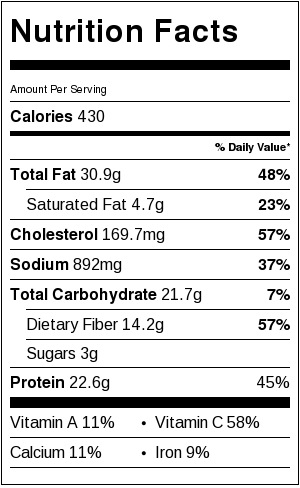 nutritional facts for two stuffed avocado halves.